Dr. Charles Taylor is Director of Instrumental Ensembles and Coordinator of Instrumental and Vocal Music Education. He conducts the wind ensemble, teaches graduate and undergraduate conducting, and supervises student teachers, as well as teaching music education courses. He is also the administrator of the UNO/Orleans Parish Public Schools Jazz Education Cooperative, in conjunction with the Louis Armstrong Education Foundation and Jazz at Lincoln Center. 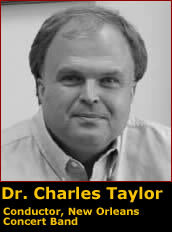 Dr. Taylor received both the Bachelor of Music and the Master of Music degrees in Music Education from the University of Cincinnati College-Conservatory of Music, and completed the Doctor of Musical Arts degree in Wind Conducting, also from the University of Cincinnati College-Conservatory of Music. Prior to his appointment to the University of New Orleans, Dr. Taylor taught middle school and high school instrumental music for 14 years in Ohio. Dr. Taylor has been active in the area of new music, premiering the works of several young composers, including Moiya Callahan, Tom Schneller, Ivica Bukvic, Jeffery Cadwell, Alexis Bacon, and Chris Watts. He has collaborated in performance with members of eighth blackbird, composer Michael Torke, flutist Bradley Garner, and trombonist Mark Babbitt, among others. Dr. Taylor serves as the conductor of the New Orleans Concert Band and is active as a guest conductor and clinician.